Charlton Ladies boss Jeremy Parsons says getting a result away to Everton, last year's FA Women's Cup runners-up, is not beyond his third-tier side. Charlton face the WSL 2 Toffees, who were playing in the top-tier of English women's football last season, on Sunday for a place in the semi-finals. "We've nothing to lose, it's definitely within us," Parsons told BBC Sport. "The pressure is on Everton, to come out and have a go at us and try and beat us. I like being the underdogs." Unbeaten since 2 November, Charlton have won 13 and drawn four of their last 17 games in all competitions. Parson's side currently lie fourth in the Southern Division of the Women's Premier League, four points behind leaders Brighton. "The FA cup throws up all sorts of scenarios," he added. "Obviously, we are the underdogs in the tie, being away from home as well. "Having that in the back of the mind will relax our players a bit more." Everton are one of four sides in WSL 2 who remain unbeaten after their first three league games. 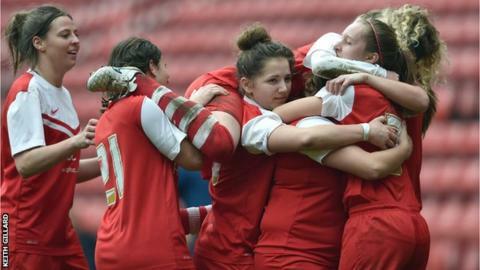 "Within the women's game, Charlton are one of the most in form teams in the country," manager Andy Spence told BBC Sport. "They've had a really positive season. "We know they're not a side we can take lightly."